It all started at the dinner table. Nick’s aunt and uncle’s dinner table, to be more exact. It was the summer of 2013 and we were in the midst of an epic 3 week road trip. On our travels we had the chance to visit some of Nick’s family members that live in more remote areas of the West. About a day into our visit we finally got around to explaining to his aunt and uncle the finer details of our food ethics preferences. Offers to pull bighorn sheep and deer meat from the freezer quickly followed. Up to this point, Nick and I had been hunting small game only. Deer hunting had been on our long term to-do list, but when that grilled venison backstrap hit my taste buds deer hunting was suddenly catapulted to high priority status. “We need to learn to do this”, I urged. Delicious food is a great motivator indeed. But one immediate problem was that deer season in California was only a few months away and Nick and I would be starting from scratch. We didn’t have any weapons that could take down a deer, we had never gone scouting for deer, and had rarely seen any deer on all of the hikes and backpacking trips we had been on. We recognized that our chances of success would be low. On the other hand, we knew we had to start somewhere. We learned an enormous amount during that first deer season and we’re currently working to share that knowledge on this site. (For example, our articles about backpack hunting gear and optics are the direct result of what we learned in many, many weeks of trial-and-error last fall). But hunting is as much about gear, strategy, and food as it is about stories we are left with when all is said and done. This is the story of the mule deer hunting mistakes we made in our first season pursuing the ‘grey ghost’. 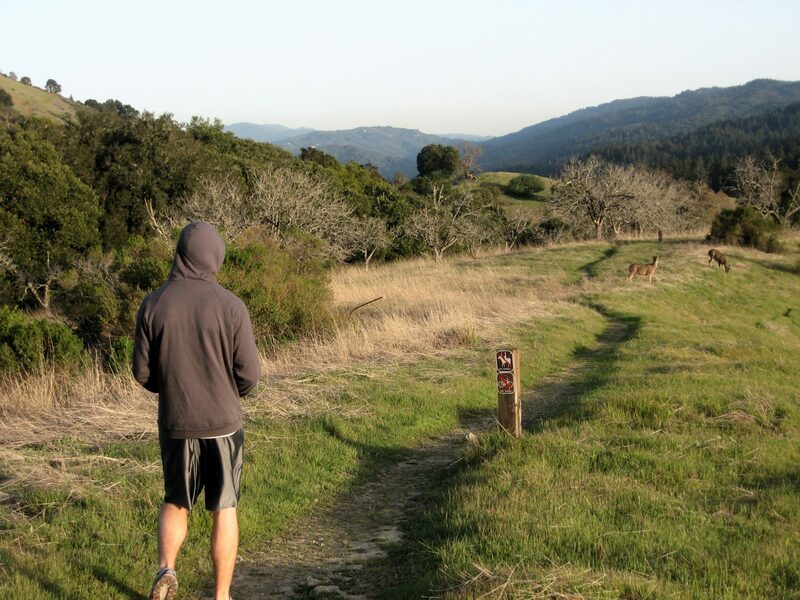 Before this first deer season my primary exposure to deer was in the open space preserves in the San Francisco Bay Area. When we lived up that way Nick and I used to enjoy hiking up in the foothills of the Santa Cruz Mountains in the late afternoons. The land itself was gorgeous: rolling grasslands bordered by oak forests, with the occasional riparian habitat thrown in alongside a trickling year-round stream. The wildlife in these preserves were well-protected: no hunting, no camping, no development, no off-road vehicles, and so on. Thinking back, it was a veritable deer paradise. It’s no wonder that the deer would come out in droves around sunset. Aside from the occasional mountain lion and coyote they hadn’t a care in the world. They didn’t seem to be particularly bothered by our human presence either, as long as we didn’t get too close. I remember occasionally trying to count them on the walk back to the car — a few times I got into the 30s. Mule deer along the hiking path in late afternoon. I naively assumed that all deer would let us get this close. After seeing this time and time again, I naively assumed that all deer operated in this exact fashion. 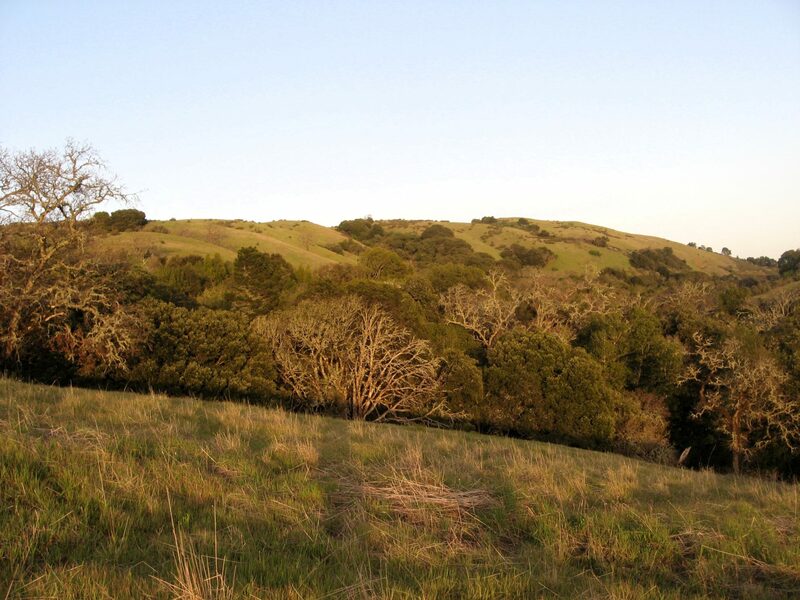 On the first pre-season scouting trip that Nick and I ever went on, we drove up a forest road to an area that looked as much like those open space preserves as possible — open grassland with some oak trees and chaparral. We donned our new camo, grabbed our binoculars, and traipsed straight through the whole area before settling down onto a rock to sit and wait for all the deer to show themselves. I’m sure you can guess what happened. That’s right — nothing happened. No deer came out. Heck, the only wildlife we saw were birds. We reasoned with ourselves: “We just didn’t pick the right spot, that’s all”. Surely we would see one or two deer come out to feed around sunset if we just found the right area. As we hadn’t seen much fresh sign around the first area we scouted, it was at least somewhat reasonable to think that we just needed to find a more ideal deer habitat in order to see deer. Back to the maps we went. And in the following weeks we hiked all over some of the most lush public land we could find. We saw lakes, trees, tasty-looking bushes, and glorious meadows. We found deer prints and deer poop galore. A lovely deer habitat. Good luck seeing wary mule deer there, though. I remember one weekend in particular — it was the weekend before the archery opener, I think. Some thunderstorms had just rolled through the area the day before, so when we showed up the next morning we found a forest full of mud. We saw some big deer prints. They were cast so cleanly in the wet ground that you could tell exactly where the deer had traveled. Knowing how fresh those tracks were, I felt sure that I was about to stumble across the responsible buck around every corner. We walked around, whispering excitedly, feeling like we had discovered some great deer treasure. But by day’s end we hadn’t even a glimpse of a deer. How could they simultaneously be everywhere and nowhere? Opening weekend of archery season arrived and things went from bad to worse. It became clear to us that there were cadres of other people who also knew about our “great deer treasure” spot. We persisted for a day, but came up completely empty handed. We knew we needed to get away from other hunters, which meant it was time to transition to backpack hunting and hit some remote country. This process is what lead us to the desert mule deer hunting that we do today. 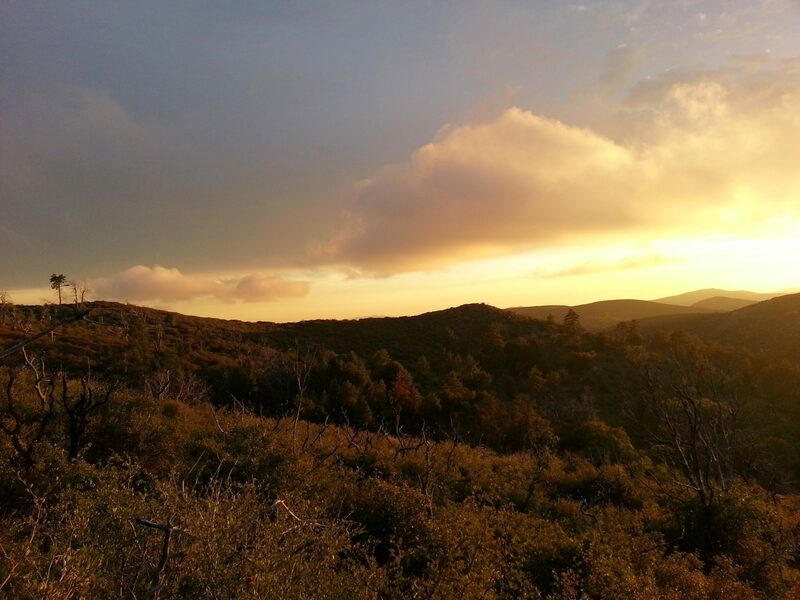 We started out in the high desert during opening weekend of rifle season. It was notably quieter than the archery opener up in the higher elevation forests. 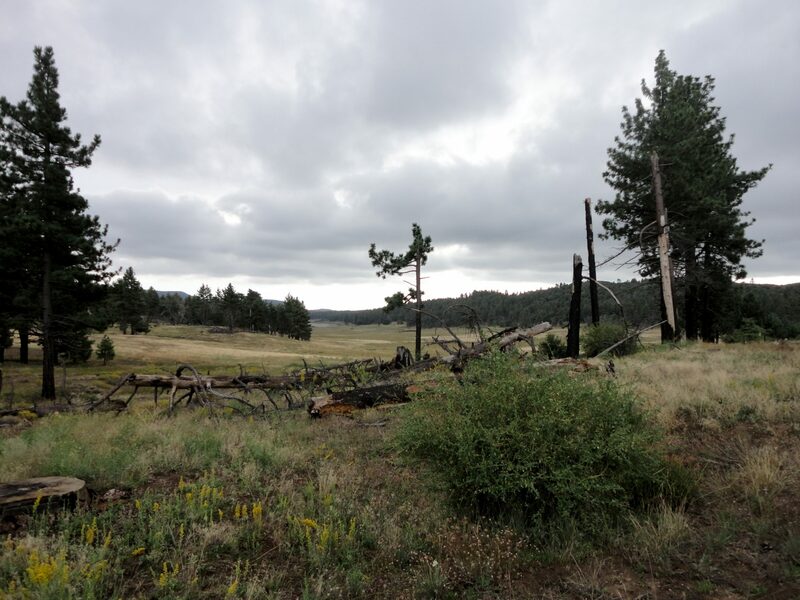 We were feeling good about our new choice of location until the same problem began to haunt us: the ground looked like the scene of a giant deer party, but multiple weekends went by without seeing an animal. We felt rather incompetent. First of all, the deer in huntable lands were not like the deer of the open space preserves. They were fearful of humans and rightly so. Second, we thought we were being so stealthy because we wore camo and talked in whispers. But we paid too little attention to another dead give away of our presence: our scent. By hiking all over the place looking for deer, we effectively spread our scent around to any nearby animals. Stealth defeated. Mule deer hunting mistake number three: we were looking for game with marginal optics. As novice deer hunters with a limited budget and ultra lightweight backpacking background, we chose cheaper, lighter binoculars and spotting scopes. While these worked all right at closer distances, they lacked the optical clarity to allow us to pick out deer that might be bedded in far away shadows. (We would quickly realize our initial choices weren’t cutting it and have to shell out even more money for upgrades — lesson learned). And finally, we had been ignoring an important terrain feature: chaparral. In California, chaparral is rather ubiquitous. Even both the forest and desert transition-zone, chaparral was all over. This plant community is sprawling and hearty. The plants are tall, thick, and dense. 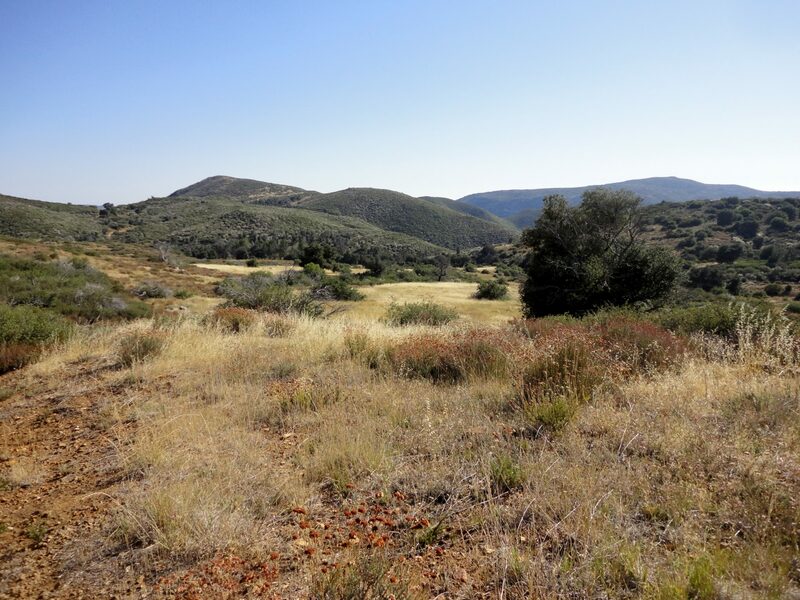 It is difficult to move through a chaparral covered landscape without a cut trail and next to impossible to traverse in a way that is stealthy and quiet (believe me, I’ve tried it plenty of times). Chaparral provides a fortress for deer to hide in. It protects them while they rest and provides a fantastic escape route if they need to elude an approaching predator. Chaparral: great for deer, bad for hunters. Putting all the pieces together, we had an array of mule deer hunting mistakes to remedy. We had skittish deer who could smell us and hide from us. Any deer within the range of our optics wouldn’t let themselves be seen, and those at a greater distance were visually undetectable to us. No wonder we went nine weekends straight without ever laying eyes on a deer. Once we had determined what the problems were, we started to solve them. Some of the solutions were relatively easy to come by. For instance, we found some moderately-priced long range and short range optics and read about techniques for glassing open country. 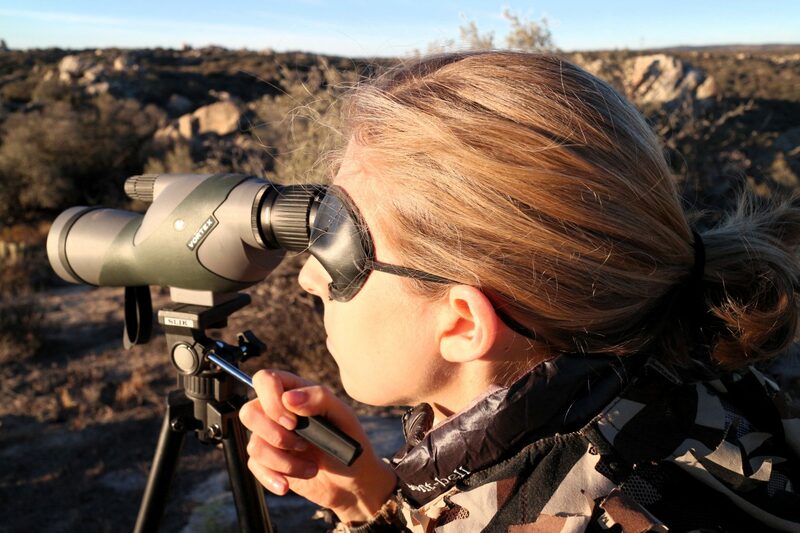 We learned to be patient — find a vantage point and stay there rather than go gallivanting all over the place — which, combined with proper reading of the wind, helped greatly with our scent control. That next weekend we saw our first deer — a small group of does on the move in the early morning. We didn’t have a doe tag and we had our eyes on them for only a few minutes, but oh how sweet it was. I spot with an eye patch so that I can keep both eyes open, reducing the likelihood of fatigue and headaches. Yet the chaparral problem still lingered. We saw that first set of does on the bare top of a ridge, as they emerged from their chaparral hiding places. Before we knew it they slipped over the ridge out of sight. While I had initially been very reluctant to push further east into the desert, watching those deer cross that eastern ridge forced me to again question my initial assumptions. It was already hot and arid in the chaparral-covered basin we had been targeting. I already had no idea where the deer were finding their water. It was hard to fathom that deer would be living in even-drier basin next door, but it seemed they were spending time there. It turns out that mule deer can survive in some of the harshest environments the southwestern can throw at them. As Dwight Schuh writes, “Few other animals, including elk or sheep, can lead you to more rugged, frightening, lonely, isolated, beautiful, awesome reaches of North American landscape than can mule deer. Find a terrible-looking piece of real estate, and 10 to 1 a big buck lives there”1. The desolate, cactus-covered valley over the ridge to the east looked like a terrible piece of real estate indeed. We decided to give it a shot. The hike in to that ridgeline was a bit grueling, mostly because I was carrying 20 pounds of gear and 20 pounds of water in a backpack designed to carry a max of 30 pounds. But the pain in my shoulders paled in comparison to my mounting excitement. I had arrived at the trailhead to trade places with our friend David who had been accompanying Nick on a mid-week hunt. The boys had hiked out to meet me and immediately reported the news: they had seen a buck! He was strolling along that deathly hot valley in the middle of the morning! The new strategy and location were clearly working. With only 2 weeks left in the season we were finally onto something. The next day we woke up an hour before sunrise and carefully crept along the boulder-strewn hillside to a spot with great wide views. We set up our tripods and put our eyes to work. Around 9am, Nick alerts me to a doe and her fawn casually milling about on a nearby shady knoll. All we could do was watch them with intense curiosity and joy. We admired the sleek body and profile of the doe, marveled at the fawn’s exploratory antics, and reacted with shock when the pair bedded right in the open. They didn’t hide up against a rock or a bush; they just scraped a little area of dirt in the wide open and plunked down. To be fair, they were on the shady side of the hill, but after all the fuss in the last nine weeks looking for these “hidden” mule deer, I almost couldn’t believe I was staring at two just sitting in the wide open desert. Fresh deer beds in the open desert. One deer leads to another, it seems. By 9:30 I had my eyes on the buck. He was quite a ways out in the valley, but I now had the optics to handle this kind of spotting. He looked to be shimmering thanks to the optical distortion created by rising heat waves, but I could see that he was a legal buck and of very nice size. I could also see that he was very interested in sniffing his doe companions. 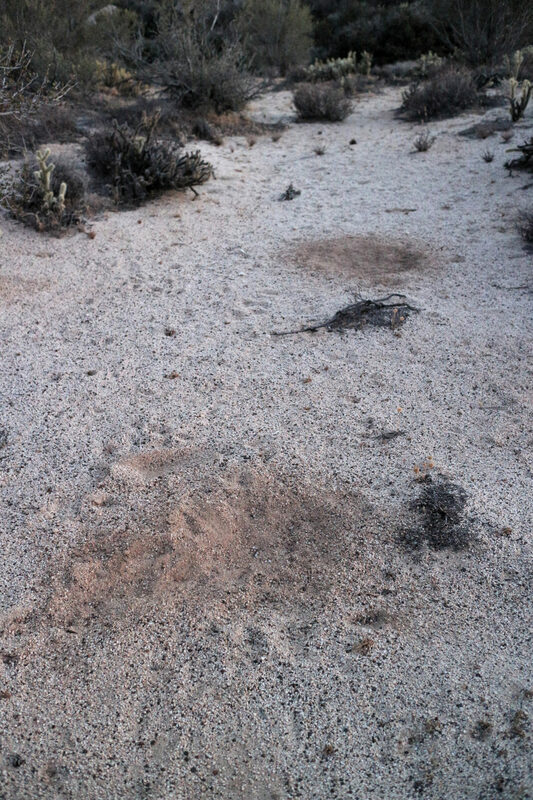 By 10am he was bedded in the tiny shadow created by a cholla cactus barely as big as he was. By 10:30am he was up and gone again, on the trail the does who seemed to be playing hard to get. These mule deer were not following the rules I had read about! They’re supposed to avoid the hot sun. They’re supposed to bed in the morning and stay there all day. They’re supposed to bed in a nice, protected bedding spot — not on an open hillside or next to a small cactus! Nick’s stalk on this rebel buck and his doe crew was ultimately unsuccessful and a story unto itself. Nevertheless, our strategy paid off. After weeks of learning through frustration and disappointment we seemed to finally figure out how to see our game. In sum, we realized that most mule deer are quite scared of people and quite good at hiding in thick cover when it’s available. We also learned that mule deer live in a wide variety of environments, from lush lakeside forests to scalding desert valleys. And most importantly, we learned how to succeed at spot and stalk hunting. Well, the spot part at least. The gap between finding deer sign and actually seeing deer can be wider than I’d ever imagined. Wide open country presents a fantastic opportunity for mule deer hunters. While stalking in close may be tricky, it certainly can be done. And it’s better than seeing no deer at all. Backcountry Hunters & Anglers Posts Nick’s Story!